Ruby Princess offers passengers a fun-filled cruise experience with ample opportunities to take in the best of ocean scenery from one of 900 onboard balconies. Ruby Princess' renowned family and youth programme, offers younger passengers the opportunity to make new friends and participate in a host of games and activities while parents can enjoy some retail therapy at one of the onboard boutiques, offering designer brands at tax and duty-free prices or simply relax by the freshwater pools on board. There are of course numerous activities which are suited to the whole family such as an open-air amphitheater showing movies both day and night, while also serving snacks. Onboard entertainment is not in short supply. Take part in your very own singing contest as part of The Voice of the Ocean. Dance the night away at one of the popular onboard nightspots, enjoy some live music or attend a theme party, the possibilities are endless and the choice of how you spend the night is all yours! For guests interested in sports, the Ruby Princess boasts numerous sporting facilities such as a nine-hole putting green for golfers of all abilities as well as a sports court. Days at sea have never looked so good! 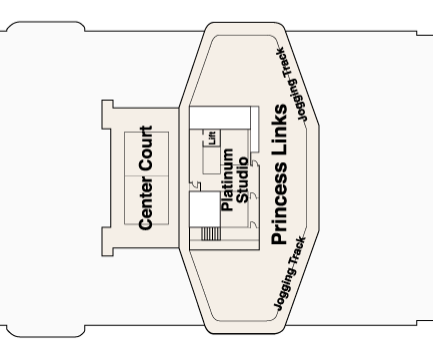 The Ruby Princess is home to 1542 luxury cabins, 80% of which feature a private balcony with a wonderful ocean view. 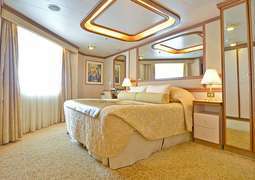 All cabins are at least 15m² large and have a private bathroom. 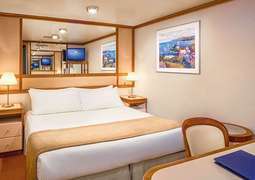 The Suites all have spacious living areas where you can relax after an adventure-packed day on board. The Ruby Princess chefs are true culinary artists who insist on serving the very finest cuisine - and it shows. Each menu is creative and the selection changes every day. Pair that with impeccable service and you're in for an unforgettable gourmet experience. There is a great variety to choose from: three main dining rooms, 'Salty Dog' gastropub, the 'Crown Grill' for steaks and seafood and much more. There is even a 24-hour buffet restaurant for you to enjoy fresh snacks around the clock. To say the nightlife on board the Ruby Princess is entertaining is an understatement. Illuminating the stage in captivating productions, the performers at the 'Princess Theatre' are some of the most talented musicians, singers and dancers at sea. The Princess Signature Shows, lounge performances, movies and casinos are just some of the entertainment the guests enjoy. The activities onboard the Ruby Princess are designed to stimulate, educate, entertain and inspire. You can be sure the crew will do their best to cover all the bases. And from art auctions to 'Lotus Spa', this ship is loaded with fun things to do. The Ruby Princess, sister ship to the Emerald Princess and Crown Princess, is a beautiful and romantic ship, the perfect vessel for your next get away with a loved one! Christened in 2008 by real life love birds Trista and Ryan Sutter of the Bachelorette, it is a ship that radiates love and romance at every turn. The Ruby Princess will also take you to special and romantic locations throughout the Mediterranean Sea and the Caribbean. 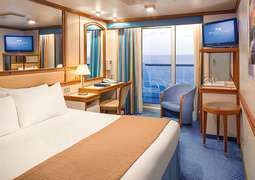 The Ruby Princess boasts over 900 luxury cabins. 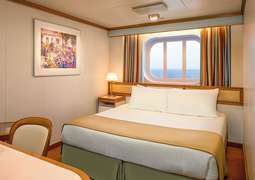 From spacious suites, which feature luxuries such as canapés, fresh flowers, flat screen TVs, ample storage space, access to the Lotus Spa thermal suite and laundry and dry cleaning services, to outside or inside cabins which offer comfort and value, there is something on board to suit every taste and budget. There is also a wide and enticing range of culinary options that are sure to delight you every day! The traditional dining rooms have a great range of dishes to offer, while the specialty restaurants, such as Sabitini’s Italian and the Chops Grill, offer exciting alternatives. An unbelievable amount to do and see on board the Ruby Princess! There are so many entertainment options on board, whatever your age or preference for activities may be! For the adults there is no end to the amount of entertainment and activities to make your time on board as enjoyable as possible. To relax, there are numerous pools and steaming hot tubs to take the edge off a busy day. For exclusive adults only experience, you could head to The Sanctuary, exclusive adults only retreat, where you can leave the rest of the ship behind, and relax completely. And speaking of relaxing completely, the Lotus Spa is the ultimate indulging and pampering experience. You could also buy that special something to remember your trip by at one of the on-board boutiques, offering great brands at discounted prices. To step it up a notch, opt for one of the many sport option available on board. A state of the art gym, jogging track and various sports courts is bound to keep you on your toes! You could swim against the current in the lap pool, play a spot of golf on the putting course or play shuffleboard. To keep the mind active, as well as the body there are a range of enrichment options on board. Classes, lectures and exhibitions are all available to you to make you time on board as educational as you desire. There is the [email protected] program as well as a library to keep you busy and informed.The ship really comes alive at night time, with a staggering and exciting range of entertainment, such as musicians, dancers and singers all there to entertain you. After one of the fabulous nightly shows, head to one of the many bars on board, to enjoy a drink and maybe a dance! You are sure to have a fabulous time on board the Ruby Princess! Call CruiseAway today to get the best deals!